Do you have some examples of fanless computers we can buy? 87. How do I install Adobe CC Complete (Photoshop, Illustrator...) in Windows? See also: How much do Adobe Photoshop and Illustrator cost? For Windows computers that has a Zenworks agent it is quite easy. First restart computer if it has any pending upgrades. Otherwise the installation will fail. Open the Adobe Complete application in the Zenworks window. Wait a very long time (all files are around 14.5 GB) for everything to install. The files are read from a file server so you have to be connected to the university network. It is possible to open a ZENworks progress window from the status bar. 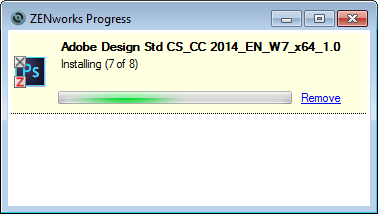 Step 7 of 8 will take a very long time. Normally in Zenworks everything may be loaded over the Internet, but in this case, since the package is so large, for technical reasons we choose to install it directly from a file server. When installing the bundle a request for registration of licenses will be automatically sent to helpdesk@bmc.uu.se who will confirm the registration at appropriate group or department. For Windows computers that do not run the Zenworks agent, the same package can be installed by a system administrator. Also contact helpdesk@bmc.uu.se for this. For macOS this installation is more or less manual. Contact helpdesk@bmc.uu.se.